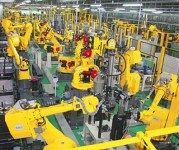 Industrial Robots – FANUC LTD.
Home » Industrial Machinery & Tool » Industrial Robots and Machines & Tool » Industrial Robots – FANUC LTD. Established in 1972. In 1974, industrial robot was developed in-house and put into operation in the company. The head office was moved to the foot of Mt. Fuji in 1984. In addition to industrial robots, CNC (computer numerical control), servo motors, electric injection molding machines, etc are among their main product lineup. “Robot Cell” developed by the company making full use of the latest intelligent robot technology is a system in which operations conventionally conducted by human hands are replaced by robots such as mounting work piece materials on the machining fixture, washing after the process, unloading from the fixture, etc. The intelligent robots are equipped with “vision sensor” functioning like a human eye and “servo hand” playing role of a hand, so that, for the first time, robots are capable of mounting a variety of work piece materials accurately on the machining fixture. Using this system, the robot will conduct machining all by itself, taking work pieces from the stock in an automatic warehouse, placing them on the fixture and completing the process. Only one maintenance and inspection operator suffices for long hours of continuous operation, realizing substantial cost cutting compared to a conventional system.